KATHMANDU, Aug 01: PATA Nepal Chapter CEO, Mr. Suresh Singh Budal attended the 10th Meeting of Nepal-China’s Tibet Joint Tourism Coordination Committee held in Lhasa, Tibet Autonomous Region (TAR) of People’s Republic of China from 22nd to 25thJuly 2018. The Nepal Delegation was led by Mr. Danduraj Ghimire, Director General, Department of Tourism, Ministry of Culture, Tourism and Civil Aviation, Government of Nepal whereas TAR of China Delegation was led by Mr. Dawa Ciren, Deputy Secretary-General of TAR Government. The Chinese side also inaugurated the “Live Music on the Train-TANG ZHU ANCIENT PATH” with the presence of Nepali delegates .Mr. Budal during the meeting shared PATA Nepal Chapter’s initiatives for sustainable development of tourism in Nepal and invited TAR delegates to collaborate and support PNC’s future promotional events and programs. Both sides reviewed the progress achieved on the understandings made in previous meetings and emphasized further cooperation in implementing them while resolving the outstanding issues if any; through mutual consultation. In an opening statement, both the leaders highlighted the excellent state of bilateral relations between Nepal and China. They underscored the need of further promoting tourism cooperation by seizing opportunities available in both sides. The leader of Nepali delegation expressed his thanks for the warm hospitality accorded to his delegation and excellent arrangements made for the meeting by TAR. In the meeting, both sides exchanged views on the various aspect of bilateral tourism cooperation and agreed on starting China-Nepal International Bus Service from Lhasa-Kerung-Kathmandu, Kathmandu-Kerung-Lhasa. 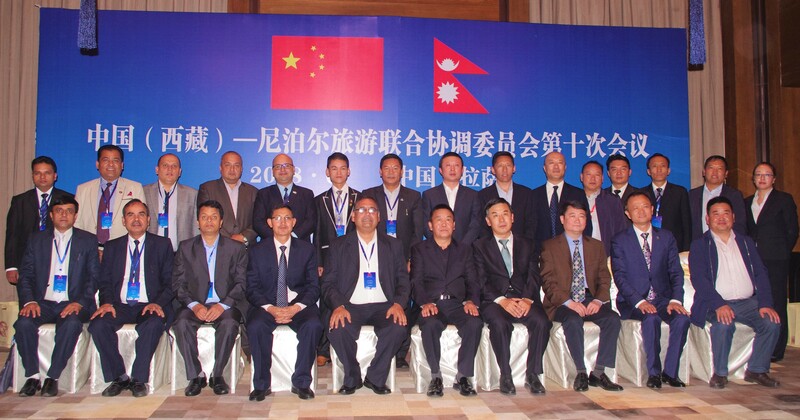 The Chinese side requested Nepali side for facilitating Chinese tourism enterprises investing in Nepal. The Nepali side agreed to coordinate with relevant government departments for providing prompt services to such Chinese investors. Both sides agreed to establish a mechanism for the mutual exchange of visits, mutual cooperation and training in the fields of mountaineering rescue, mountaineering techniques, and hotel industry. Both sides held discussions on starting cross-border one-day tours under existing bilateral agreements. Both sides held discussions on planning and building of Mt. Kailash Tourist Cooperation Zone. The Chinese side is willing to encourage enterprises from Nepal to open their outlets and sell their tourist products in TAR, China. The Nepali side agreed to disseminate this information to Nepali enterprises. The Chinese side will invite representatives from Nepali tourism industry to participate in Fourth China’s Tibet Tourism and Culture International Tourism Expo. The Chinese side is also willing to actively participate in all kinds of expos and events organized by the Nepali side. Both sides agreed to organize a joint tourism promotion program of TAR, China and Nepal in major cities of China which will support the Visit Nepal Year 2020 campaign. Both sides would organize joint marketing and promotion of such events and touristic products. The Nepali side requested Chinese side to issue multiple entry visas for mountaineering, trekking and tour teams including support staff entering TAR territory from Nepal. The Chinese side suggested Nepali side to pursue this issue through diplomatic channels. Both sides agreed to report to their respective Civil Aviation Authorities for increasing flights between Lhasa and Kathmandu by installing required equipment in aircraft to meet standards for high altitude. Both sides agreed to exchange information concerning high peak mountaineering activities on border areas. Both sides agreed to establish mutual understanding on operating expeditions on high peaks along the border area and both sides would also engage in promoting mountaineering expeditions of border peaks in international fora.Both sides agreed to hold the 11th Nepal-China’s Tibet Joint Tourism Coordination Committee Meeting in mutually convenient time in the year 2019 in Nepal. 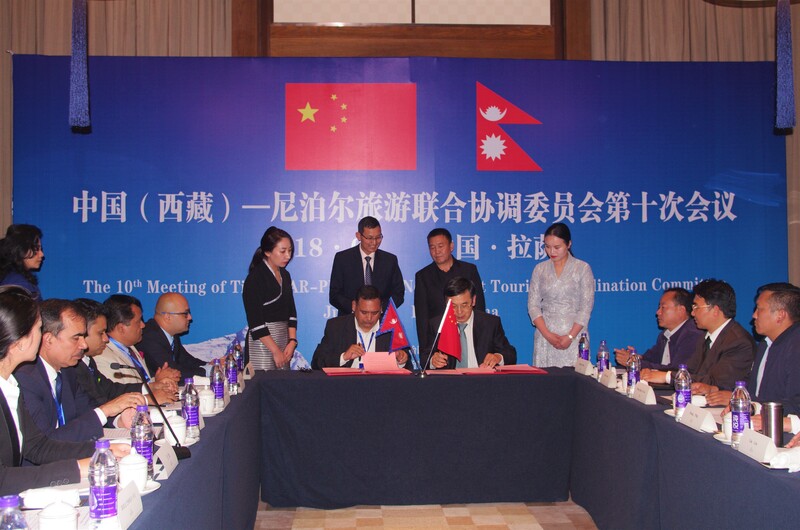 In addition to these agreements, Nepali Delegates were welcomed to witness the first Meeting of China – South Asia Plateau Passage (P&P) Tourism Promotion Alliance where the four provinces (Shanxi, Gansu, Qinghai, and Tibet) signed MOU under the One Road One Belt Campaign to cooperate under this alliance. Chang’an through Kerung port connects South Asia in the shortest distance and Chinese side are committed to working for Ancient Plateau Silk Road” which could be named as “High-Plateau Silk Road” which is the transformed train route of “Tang-Tibet-India old trail” beginning from Chang’an (capital of the Tang Dynasty), going through Shanxi, Gansu, Qinghai, and Tibet, via the Kerung port, and hence follows down the distance to Nepal and India.